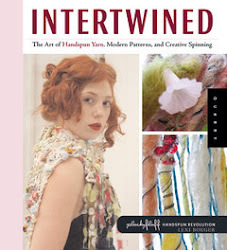 ..especially out under the pine tree with yarn and good company! It's been a hot stifling summer weekend, so the kids and I set up this peaceful afternoon scene in order to get through without tears. I love it when my children ask me to do some dyeing.. it's pretty much a sure thing i'll say yes, so we're all hap-hap-happy! My three were keen to whip out the Dye Kits they had stashed on their craft shelf. The apprentices' focus on the activity for the afternoon was impeccable. Sheer delight in observing the colours appear on the wool is like magic to them. I personally vouch for these kits as a popular summer craft activity that is sure to get a good solid hour of Peace for mama! And that's gotta be worth gold! 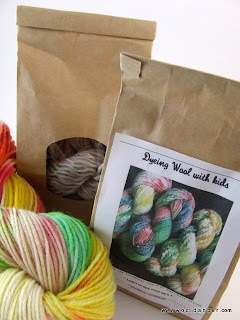 I have blogged about dyeing with children before & you may think I'm a little OTT mentioning it again, i find it's a savior 'emergency' activity for me.. especially when i want to get some of my own dyeing done! 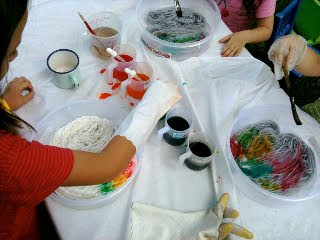 Happy Dye Kits were really popular at markets last year. I have just listed them in the shop for school holiday activity ideas & they make perfect gifts too! I'm sure your kids will love to paint rainbows on wool. I will be updating the shop with more items throughout this week.. i'm playing catch up for the lack of activity on the update front late last year. So all batt clubs are getting shipments, custom orders happening & my workshop on the weekend is experiencing final touches too! phew! Oh, & i haven't forgotten PART 2 of the PINBOARD LOOM art yarn weaving tutorial.. as soon as I figure out how to upload pix from Mr Wooldancer's new Nikon (and if the low-light pix work out) i'll be good to go! You are so right - I've just started learning to dye wool with my oldest (now 5) and she loves it. Especially if we do pink and pink and more pink! Your kits sound like a great idea - will go check them out on your website (which is awesome by the way). why thank YOU ;) i feel the site is in need of renewing.. tho I'm a touch ambitious!